Women’s Empowerment Program Assistant (Virginia): LSS/NCA’s Virginia resettlement office is seeking a volunteer to assist in the management of our newly formed women’s empowerment programming. This programming hopes to engage female clients through professional and vocational development, educational and English language enrichment, and mental and physical health education. LSS/NCA seeks a volunteer to assist in the development and management of this programming. Some weekend hours will be necessary. Youth Haven Mentor/Counselor (Washington, DC): Volunteers are matched with participants in our youth development and wellness program to provide mentoring. Mentors/Counselors and participants will attend wellness, team building, and family events and potentially engage with participants outside of group activities. Activities take place monthly during two-hour time blocks on weekends. Volunteers must pass a background check and be willing to report the number of hours worked to LSS/NCA (Time commitment: up to 3 hours per week, but not every week). Mentors are also eligible to participate as overnight camp counselors during camp/retreat sessions. Driver (Washington, DC): Volunteers provide transportation to and from weekly events for participants in our Youth Haven program. Volunteer will drive youth participants to and from weekly LSS-sponsored events. Volunteers must pass a background check, provide their own reliable vehicle, have a valid driver’s license, and be willing to report the number of hours worked to LSS/NCA (Time commitment: 4 hours weekly, evenings and weekends only). Videographer & Editor (remote): Every year, LSS/NCA seeks to illustrate the wonderful new beginnings created through LSS/NCA and the generosity of our community. A videographer and editor are needed to film these stories by following a refugee family, an adoptive child, and/or a youth impacted by the stigma of illness or substance abuse. The volunteer team will work with the Director of Communications to complete a seven minute video story and shorter teaser videos to share via social media. Help us share these powerful and inspirational stories through your talents. Blogger (remote): Join our blogging team. Self-assign to blog topics that interest you from our pre-scheduled and determined range of topic areas. Respond to local/national news, interview our staff, or share inspiring stories or quotes related to LSS/NCA services. Volunteers will work directly with the Director of Communications. 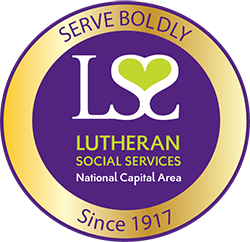 Thank You Volunteer (remote and Washington, DC): LSS/NCA is powered by the cash and in-kind donations and volunteer time given by our loyal supporters. We are looking for volunteers to help us recognize this generous support by providing a personal touch to our messages of gratitude. Help us recognize donors and volunteers with notes, cards, and thank you calls. We have so much to be thankful for but not a lot of staff to express how grateful we are or how much we appreciate our donors and volunteers. Google Analytics or Adwords (remote): Are you well versed in Google technology? Use your skills to make change and enhance the agency’s visibility in our community to serve more people. Google adword volunteer must dedicate at least 1-2 hours each week crafting new ads, monitoring keywords, and maintaining the agency Google adword account. Analytics volunteer must dedicate at least 1-2 hours each week establishing website goals, monitoring traffic, and providing suggestions to improve ROI. Volunteers will work in partnership with the Director of Communications and must have a working knowledge of Google platforms. Outreach Team (various location): LSS/NCA is frequently invited to have a table or booth at events, fairs and festivals in the community. Outreach Team volunteers represent LSS/NCA and answer questions at these tabling events. The volunteers are provided with the informational materials to set up at the table and with answers to FAQs. Tabling events generally last two to three hours and may be in the evening or on a weekend. This position allows for a flexible and on-call time commitment. Volunteers should be friendly, personable, and excited to share the work of all of LSS/NCA’s programs with the community. Speakers Bureau: Attend events as an LSS/NCA representative to help staff manage increased appearance requests and broaden community awareness. Speakers will be trained to answer questions about agency programming and share stories to at speaking engagements to influence support. Making copies for files and attaching the application documents to our electronic data system. Co-ordinator-This is an opportunity for a volunteer to assist LSS/NCA staff to manage the scholarship program. The work is cyclical with the greatest activity when the applications are due (April), as they are evaluated (May). Notifying successful and unsuccessful applicants (June) and tracking claims for scholarship funds (August) and revision of application forms and publicity (Dec and January) could also be part of the responsibilities. Judge- Volunteer judges to review the scholarship applications are also needed. Their work is limited to May and April of 2019. Group volunteer opportunities: Volunteer groups and congregations are welcome to devote their time to various on-going or one-time projects and opportunities. Opportunities are not limited to the list below. Groups are welcome to present a thought-out idea for a volunteer project that can be fulfilled through the time commitment of the volunteer group. Staff assistance outside of marketing events to clients may be limited. Often transportation is a necessity for client involvement. If transportation is provided by volunteers, a background check is necessary. Please reach out to the Community Outreach Director to explore such opportunities. Host clinics for career development, college prep, computer skill building, drivers’ ed.